The following 19 nominal species are included in the genus. 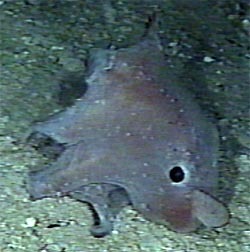 Species of Opisthoteuthis are the most compressed, in the anterior-posterior axis, of any cephalopod. This flattened appearance (due sometimes to preservation) gives them the common name of flapjack or pancake devilfish. Fresh specimens have ovoid form. Species are thought to be primarily benthic although they are capable of swimming and in some species the swimming may be an important component of their pouncing on minute prey. As in other cirrates, most species are poorly known. An introduction to an Opisthoteuthis is seen in this video. From Stephanie Bush, "The Opisthoteuthis eggs depicted in this video are preserved specimens, not the eggs laid at the Monterey Bay Aquarium (which are still being lovingly incubated at MBARI's Cold Storage Facility!.)" with one or two fields of enlarged suckers on arms of mature males. with white body penetrated by two or more separate optic nerve bundles. without tooth-like structures in sucker aperture. *Collins and Villanueva (2006) use this same diagnosis to define their family Opisthoteuthidae which contains this single genus. Arms of males generally with modified suckers (i.e., enlarged and often with complex alignment) in one or two fields (proximal and distal). Cirri short (in preserved animals). Cirri may be retractile into pockets. The retractile (rather than just contractile) nature of the cirri has been suggested by several authors due to their appearance in preserved animals. However, this attribute remains uncertain. Web nodules (= web supports; these are often difficult to detect) present as multiple or single nodules or absent. Figure. Oral view of Opisthoteuthis grimaldii (?). Photograph shows multiple web nodules, some of which are indicated by the arrows. Also note the rather long cirri in this live Opisthoteuthis. Photograph from a submersible. Eyes large, diameter often 60-70% of ML, 50% of head width. Two or more bundles of optic tract penetrate white body. Optic lobe kidney-shaped in cross-section. Small, length approximately half mantle width. U-shaped, lateral walls (=wings) not parallel (i.e., spread between walls increases toward tips). Outer surface of saddle usually with groove (narrow or broad, shallow or deep); outer surface rarely flat. Wing frequently terminates as elongate, simple, pointed cone; termination complex in some species. 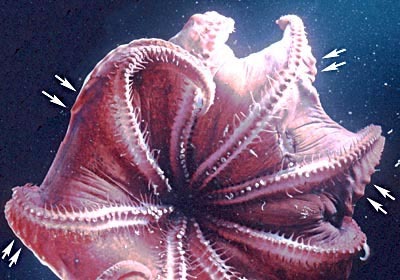 Although the shell lies at an angle to the body axis, the variation in the angle of the spread of its lateral walls presumably is a measure of the "flatness" (i.e., compression of the anterior-poterior body axis) of the octopod. The extreme flatness of some Opisthoteuthis is apparent in this video. Areolar spots present. In some species these are difficult to detect or absent. Figure. 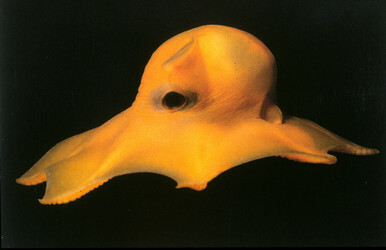 Side view of Opisthoteuthis agassizii. Photograph from submersible. In this photograph, the lines of white areolar spots are easily seen, especially on the arms. Intestine approximately 1.5 - 2.0 times esophagus (and crop) in length. Digestive tract not a simple loop (i.e., intestine makes lateral bends and/or loops. Digestive gland bilobed or unilobed. 31-34 No 68-81 V-shape Absent Yes Off S. Aust. 59-88 V-shape Absent Yes Off S. Aust. *From illustration. ** DESD = Distal field enlarged sucker diameter; PESD = Proximal field enlarged sucker diameter. For the purposes of this table, a distal field is considered to be absent if suckers there do not show a distinct enlargement. Chun, C. 1915. Die Cephalopoden. Myopsida, Octopoda. Wissenschaftliche Ergebnisse der Deutschen Tiefsee-Expedition, "Valdivia" 1898-1899, 18 (2): 405-522 + Atlas. Sweeney, M.J. 2001. Current Classification of Recent Cephalopoda. pdf file, 59 pp. Villanueva, R., Collins, M., Sanchez, P. and N. Voss. 2002. Systematics, distribution and biology of the cirrate octopods of the genus Opisthoteuthis (Mollusca, Cephalopoda) in the Atlantic Ocean, with description of two new species. Bulletin of Marine Science 71(2):933-985. Villanueva R., R.E. Young, M. Vecchione. 2008. Opisthoteuthis Verrill 1883. Flapjack devil shes. Version 28 Apr. 2008 (under construction). Available at http://tolweb.org/Op isthoteuthis/20106/2008.04.28 in The Tree of Life Web Project, http://tolweb.org/. Voss, G. L. and W. G. Pearcy. 1990. Deep-water octopods (Mollusca: Cephalopoda) of the Northeastern Pacific. Proc. Calif. Acad. Sci. 47: 47-94.